TWO years after his new partner's arrival, John Garton died, at the age of 69, and John King decided to combine with another Exeter ironmonger named Munk. The firm was then styled "King & Munk," (see note) but within a year the partnership was dissolved and the previous title reappeared. At this time the firm employed the disc system for checking the workmen's time of arrival. Each man was allotted a numbered metal disc, and all the discs were kept on appropriately numbered hooks on a board in the works office. Above the board was a large accusing clock. All workmen had to pass in through the works office. Each man took his disc and dropped it into a slot in a box, whence the discs were later retrieved and rehung. 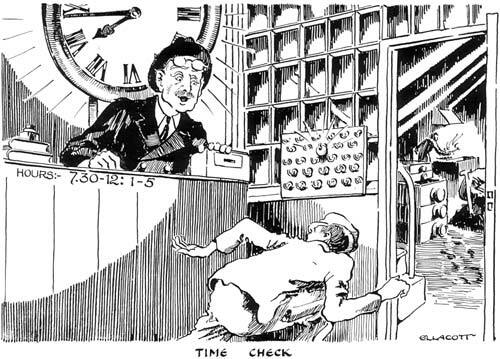 The timekeeper or the manager sat like Cerberus under the clock during checking in. If any wretch came late and managed to avoid the office, his disc still hung accusingly on its hook, to testify that he had not checked in, and he was searched out for censure. Sometimes a latecomer made a futile effort to crash his way through the office without stopping to check. It only meant that he was pursued by the manager with yells. When the disc system was finally superseded by the time card, the discs were still preserved as relics. After Garton's death, John Gould King managed the firm with the sporadic assistance of his son. The latter was an extraordinarily gifted draughtsman, and a number of his fine drawings are still preserved. However, his powers of application did not equal his draughtsmanship, so he did not gain a footing in the business. An epoch-making event occurred in 1898, vet at the time the event seemed unremarkable. A small, quiet-voiced, youngish man of 36 passed under the Golden Hammer to enter into partnership with John King. This young man was Hugo Holladay, who had come from Faversham, in Kent. He had completed, some Nears before, an apprenticeship in ironmongery with the firm of Tett & Hussey, Faversham – which service had been begun at the princely wage of two shillings a week. No change was made in the name of the firm, but Hugo Holladay soon made his presence felt. He was a man of immense business acumen, ideally suited to administer the retail side of the firm, and 190 High Street took a new lease of life. Two years later, in 1900, King died, and the next stage of the new era was attained when Hugo Holladay was joined by his younger brother Edgar-a man of the same quiet manner as his brother, and sharing with him that peculiar quality of penetration so valuable to the business man. Edgar was to take over the engineering side of the firm-a feat of considerable magnitude, for he had been trained as a brewer, without the slightest knowledge of engineering. Yet, with the most remarkable tenacity he applied himself to the mighty task, learning as he went and relying upon his native wit to see him through difficulties as they arose. He had one advantage ; coming as he did from the world outside engineering, his mind was unbiased by any of the antique fetishes to be found in every trade. Edgar Holladay saw only logical conclusions, and bringing to bear the newest scientific methods of the day, which he doggedly taught himself, he beat down old rule-of-thumb practices by sheer hard fact and logic. His success was all the more praiseworthy when one remembers that he was already thirty-three when he entered the firm, and learning does not become easier when the first youth is past. 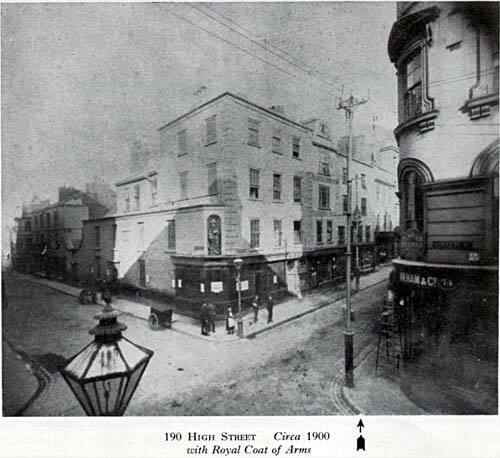 Each brother kept to his own province, Hugo in the retail premises at 190 High Street, and Edgar in his offices overlooking the foundry and fitting shops. 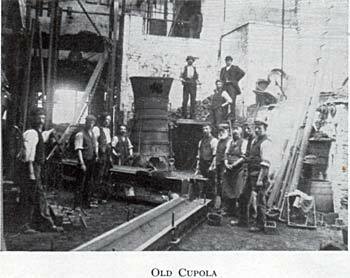 At the outset, the works supplied a good deal of material for the "front shop," but as mass production increased in the great iron working centres, it became more economical to buy for retail. This change had an adverse effect on the foundry, whose output dwindled to a negligible amount. In 1914 the Golden Hammer overlooked the marching ranks with their blaring bands, heading for a war immeasurably greater than any war since the Hammer had first swung from its bracket. Beneath it also passed the women of the new era, going to do men's work so that the muddy trenches might be kept manned-the post-women and the coal-women and the sweep women, all doing jobs unheard of for Englishwomen of that day. Slowly the black months dragged along, until bells and music and joyous voices rang out the dreary four years and welcomed peace. Peace-a time for rebuilding nations and trade. The Golden Hammer, partly eclipsed by the gloom of war, shone out brightly again as the two Holladays strove to take advantage of the revived flow of business. Their build-up was so effective that in 1924 they decided to consolidate their footing by forming a limited liability concern. The board comprised Hugo and Edgar Holladay, with Hugo as Chairman. Edgar was now able to expand the shrunken foundry output by seeking contracts for municipal work and small builders' castings, with the accent on repetition work that could he produced from pattern plates and moulding machines. Ranges and grates no longer formed an appreciable part of the work, for the increase in gas cooking was cutting down the number of coal ranges used in urban areas. 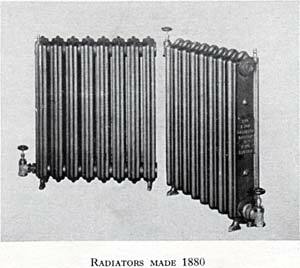 However, gas cookers were almost entirely of cast iron, so there was ample work in producing parts for these. The early 1930's saw further changes. In 1932 Henry Edgar Eland Holladay, Edgar Holladay's elder son, joined the Company. His entry presaged an event that was to break one of the links with John Atken. Hugo Holladay retired in 1933, and the historic "front shop "was closed and the premises let on a long lease, after an unbroken record of over 270 years. The famous Golden Hammer was carefully rehung before the Waterbeer Street premises, and Henry Holladay became a director of a company whose ironmongery department was now much reduced. A chain is parted by the breaking of a single link, and so it proved with the Company's affairs. Only three years after the closure of 190 High Street the firm was forced to contemplate complete removal. A notice of requisition was served by the City Council, with a view to using the firm's Waterbeer Street premises in a scheme for a new Civic Centre. Two courses of action presented themselves to the directors-to close down, or to seek new premises on the outskirts of the City. A period of frenzied activity and vexatious setbacks culminated in the choice of a site in Tan Lane, St. Thomas, and after much negotiating the purchase was made. A complete new plant was erected, comprising foundry, pattern shop, machine shop, offices, stores, etc., and a link with the centre of the City was maintained by establishing a showroom in Central Station Buildings, Queen Street. By this time (1938) a new director had been appointed to the Board-Alec Hugo Holladay younger brother of Henry Holladay. During July and August, 1939, came the end of an era and the final severance between the Golden Hammer and St. Petrock's parish. The removal having been completed, the famous symbol was rehung over the new works, to begin another chapter of its story. Note: Since the writing of either version of the Golden Hammer much evidence has been discovered to show that the period that the business traded as King & Munk was not only longer than originally thought but also later in time than the late 1860s as originally suggested. Many entries and documents that are dated exist and give evidence to suggest that the business traded as King & Munk from about May 1883 up until about October 1885. The Bristol Mercury and Daily Post, Thursday 31 May 1883 referred to King & Munk’s Stand at the Bath & West Show and the Flying Post of 21st May 1884 carried a two column advert placed by King & Munk in connection with the Devon County Agricultural Show. Underneath the heading appear the words “late Garton & King” in small type. Ledger entries and Shipping Agent documents consistently refer to the business as King & Munk throughout this period.